A quirky Melbourne operation upcycling office waste came into being when a pair of activists collided paths with a multinational corporation, writes Nadia Boyce in this week’s Spotlight on Social Enterprise. Saucepans stuffed with cooked noodles and filing cabinets holding ephemera from lives past are among the bizarre objects filling the warehouse of Green Collect – objects that tell stories like those working with them, who have overcome life’s challenges to sustain employment by upcycling office waste. The decade old Melbourne social enterprise has made it a mission to recycle the ordinary and everyday objects that are landfill-bound – such as corks, discs, binders, cabinets, mobile phones, toner cartridges and bottle tops. The people making this happen are the socially disadvantaged, employed by Green Collect for a chance to break free of the cycle of homelessness and unemployment. The organisation has emerged as a stalwart in the social enterprise space, the product of cross-sectoral collaboration and the turning of a humble startup into something truly impacting the community. Green Collect in its first form was borne out of a twist of fate that brought together a pair of passionate social and environmental activists with a multinational corporation looking to do something good for the world. The organisation is headed by former social worker Sally Quinn and partner and environmental champion Darren Andrews. A decade ago the pair were looking to combine their passions in a business venture, toying with the idea of combining their social and environmental interests and supporting those at the end of the job queue. Convergence of their passions came most unexpectedly. “Amazingly, we were approached to run a pilot,” Quinn says. BP Australia had formulated an early-stage cork collection program and Quinn and Andrews were headhunted to get it off the ground. With BP on board the program was able to secure seed funding from the Federal Government. Corks became symbolic as the program extended to collection of high value items that would ordinarily go to landfill. “They were thinking about corporate citizenship…whether a company could lend its resources to help the community it operates in,” Quinn says. “When sectors can identify common ground and gaps in expertise…when that expertise is shared, amazing things can happen. 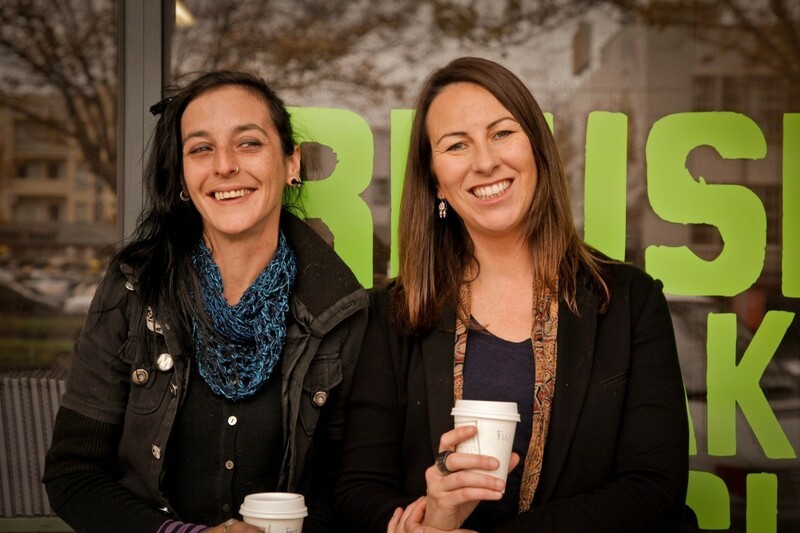 “We hadn’t heard the term social enterprise and we didn’t know what that’s what we were doing. She and Andrews had participated in grassroots activism and were initially cautious of joining forces with the petrol giant. “What we realised is that in joining their [business] system we could effect change," she says. Quinn says the model turns traditional ideas of welfare on its head. “It’s quite a powerful shift…being defined as someone taking away resources to becoming someone helping to solve problems,” she says. Green Collect now has a suite of operations providing employment. Its foundation service is its collection service, where corporate clients pay a fee to have their office waste taken away and sorted and disposed of for the best environmental outcomes. It is complemented by two retail shopfronts in Yarraville and Dandenong selling upcycled goods sourced from the Green Collect warehouse, where waste items are stripped down into commodities and onsold or refashioned into new products. An old stack of letterheads may be guillotined and upcycled into a notebook covered by PVC which formerly covered a binder. Green Collect has proven a respite for many of those in disadvantaged communities, giving them a new lease on life through the opportunity to earn a living in a supportive environment. “They [staff] say, ‘I feel like I’ve been recycled. People didn’t recognise my value,” she says. Quinn’s former career as a social worker exposed her to the difficulties faced by some people in the community, such as female victims of domestic violence trying to rebuild their lives. The Green Collect workplace culture is built around nurturing and care. “It’s about them having a workplace that values them,” she says. “We express that in a way that says its okay to talk about problems you’re having in your life. “You’re not a client or a participant in a work program…you have keys! The organisation helps a range of people experiencing many forms of disadvantage – whether mental illness, long-term homeless or victims of domestic violence. “We don’t really have a target group. We try and see ourselves like any other employer. We’re not going to employ only one type of people," she says. The organisation is currently building a program with refugee and new migrant retail trainees. The great advantage of the program, Quinn says, is the simple thing of “having the opportunity to practice their English and welcome people into the shop”. She says it is an important way to make refugees and new migrants feel welcome – “especially with all the current policies and all the messages they receive – like ‘you’re a problem here’". Growth, profitability and interaction with the broader social enterprise community are all on Quinn’s agenda for 2014. She says that some measure of financial sustainability is key for any organisation, even those classed as Not for Profits. “I think whether you’re a Not for Profit or For profit business these days you have to be making a profit to stay afloat…it’s about staying true to your mission and vision, for which you need financial backing,” she says. “We’re being profitable to work towards our mission. Sometimes there are different ways to get to that end goal and we should encourage anyone who strives for that. Openness, she says, is critical for any business also working towards social goals. Communicating outcomes is now taking on a more significant role in the organisation, she says. “Because we’ve grown organically and we’ve really tried to work with people in natural ways we didn’t set up measuring tools in the beginning," she says. “As we’ve gone along we’ve realised that’s a very important thing to do to help people realise the value in working with Green Collect. “I think a lot of programs with short term outcomes don’t necessarily create sustainable change in people’s lives. “For a lot of people Green Collect will be a job for life. “We encourage a lot of storytelling within our organisation,” Quinn says, adding that anecdotal evidence has formed a backbone of evidence for the organisation’s social purpose. “Now that we’re players in the social enterprise sector, we need to be communicating in ways that are more meaningful. “It feels more important now that we demonstrate what Green Collect achieves. “In the beginning it was all about knowing the faces. What we’ve had to add is knowing the numbers…where we need to be in a business sense. “We are aiming for significant growth over the next one to five years and that’s where measuring tools become really important… it’s giving us greater confidence in knowing which parts of the business are most profitable. A business focus has given the team renewed confidence. In 2014 Green Collect will be looking at close to 100 per cent profitability, she says. 80 per cent of funds currently come from operating income with the remaining 20 per cent from philanthropy or grants. The organisation is now looking for investment. “Next year will be a really exciting time for us," she says. “We’re really confident now because we’ve done it small scale and we know it works and can run with it. Quinn sees a positive future for social enterprise in Australia. “Now there’s an opportunity to create and shape the culture of the sector. We really want to contribute to the sector, especially with young people,” she says. “We’re keen to have a voice, shaping a culture that is enterprising, that has life and is positive. We want to be there looking for innovation and best practice. Do people really care about ethical fashion? It’s time to solve it, Australia!